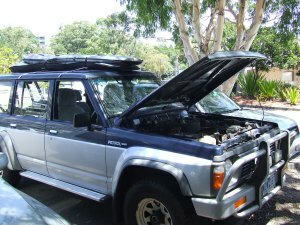 This morning we packed up for the day and set out to explore Port Stephens, 30 minutes in Colin noticed the car was over heating. We pulled into a car park and when the bonnet was lifted we were greeted with a hiss of steam and water pouring out. Not a good sign. After topping up with water and finding the address of the nearest garage we set off but did not get far. We returned to the car park and called the RACV. At least we could wait in the shade with toilets and shops close by. The girls took themselves off to explore the shops and Marina close by. Eventually the road side assist guy arrived, got us going and gave us the address of a radiator specialist (obvious leak in the cooling system). We left the girls to continue shopping while we made the short trip to a garage. Bottom line – the car shouldn’t be driven, at least not the distances we need to cover between Lemon Tree Passage and other parts of Port Stephens - and the guy can’t fix it til Wednesday. We called on the extra care cover we have with the RACV (for just such situations as this) and they organised a hire car for us. However the organisation and collection of the car took ALL afternoon – many phone calls, waiting for a taxi, having to detour back to the caravan park to collect licences which we were not carrying, driving out to the airport to collect the hire car etc…. Finally at 5pm we collected the girls, their quick look around the shops had turned into an all day marathon. Luckily they found plenty to do around the Port Nelson foreshore. We were fortunate in many regards, to have RACV assistance, to be in a town and not stranded on a highway, that the girls could occupy themselves, that I had given the girls some cash…. etc… However spending all day waiting, sitting in cars and at a garage, in a taxi and hire car was not how we would choose to spend the day. ‘Wasting’ one day when there are only 5 left felt frustrating – that would be a case of ‘perspective’ happening….. Strange how you can feel exhausted after a day of doing nothing. Tomorrow we will think about the problem of what to do with the surf boards that are in the Patrol. It does not look as though our soft racks will fit on top of the hire car, perhaps they will have to stay in the Patrol until Wednesday/it is fixed. Colin is in denial on this matter I think. If there is a way to do it, he will find it. I will head to the showers and wash away the day and contemplate an evening of loud music – there is a disco on the ‘activities for the day’ here at the caravan park. The music is loud that’s for sure, at least the music is OK – Men at Work, I Come from a Land Down Under, at the moment. Sounds like music meant for the parents not for the kids. Oh dear, now it is Achey Breaky Heart ….. could be a long night. At least it finishes at 9pm.